Biography of Renaissance Architect, Mannerism Period. One of the greatest architects of the Mannerism era, (although his late work also anticipated elements of Baroque architecture) Giacomo Barozzi da Vignola was inspired by the Roman architect Vitruvius, and by his own early studies and architectural drawings of Classical buildings in Rome, and at Fontainebleau near Paris. He is noted, in particular, for his treatise "Rules of the Five Orders of Architecture" (Regola delli cinque ordini d'architettura), published in 1562, which explained his method for constructing columns using the proportions of the four main classical orders (Tuscan, Doric, Ionic, Corinthian). It remains one of the most theoretically important works in the history of architecture. His second theoretical work "Two Rules of Practical Perspective" (1583) (Due regole della prospettiva pratica) was not published until after his death. He remains a significant figure in Renaissance Architecture of the cinquecento. Born in Vignola, near Modena (Emilia-Romagna), and trained in Emilia as a perspective artist, Vignola turned to architecture early on, influenced by both the treatise (Seven Books of Architecture) and practical designs of fellow Bolognese architect Sebastiano Serlio (1475-1554). After working at the Fontainebleau School in France with Francesco Primaticcio (1504-1570), he settled in Rome where he became papal architect to Pope Julius III in 1550, and the favourite architect of the Farnese family, making for them the family palace and the villa at Caprarola. For Pope Julius III he worked on the Villa Giulia (begun 1550), under the direction of Giorgio Vasari (1511-74) and Michelangelo (1475-1564), in which the articulation of the architectural organism is sensitive to the surrounding natural space. He made the Italian-style garden and park of Villa Lante at Bagnaia (begun 1556) as well as numerous religious buildings, of which the most important is the late church of S Anna dei Palafrenieri (c.1570) in the Vatican. 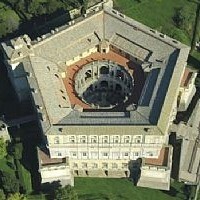 During the mid-1560s he also supervised the construction of the two subordinate domes of St Peter's Basilica (1506-1626). 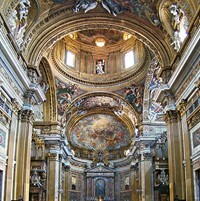 His masterpiece, however, was the Church of Gesu (begun 1568), the mother church of the Jesuits, which inaugurated the single-hall church made to serve the Counter-Reformation's special needs in terms of preaching and the litany. Its design established the standard for ecclesistical architecture, and religious art, and became the model for future churches worldwide. For more about the glorious illusionist murals of the Church of Gesu, see also: Quadratura as well as Trompe L'Oeil Painting. See also: Venetian Renaissance Architecture of the period, which was dominated by Sansovino and Palladio. In addition to those mentioned above, the best known architects of the Italian Renaissance included: Filippo Brunelleschi (1377-1446), Leon Battista Alberti (1404-1472), Giuliano da Sangallo (1443-1516), Donato Bramante (1444-1514), Baldessare Peruzzi (1481-1536), Raphael (1483-1520), Antonio da Sangallo the Younger (1484-1546), Michele Sanmicheli (1484-1559), Jacopo Sansovino (1486-1570), Giulio Romano (1499-1546), Andrea Palladio (1508-80), Giacomo della Porta (1533-1602), Vincenzo Scamozzi (1548-1616) and Carlo Maderno (1556-1629).  For more about Late Renaissance architecture, see: Homepage.